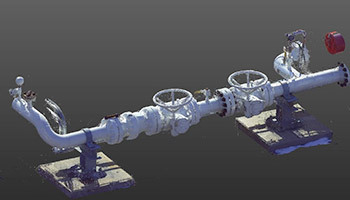 Hanover Engineering currently provides cost effective 3D laser scanning services for a variety of clients in the mechanical, civil, and structural engineering professions to meet their project specific measuring and mapping needs. With the technology utilized, we can capture up to 1 million data points per second and achieve an accuracy that traditional surveying can only rival. This precise detail is not possible with traditional survey techniques and provides you with viewable and measurable information that is almost better than actually being on site. 3D laser scanning provides you with a realistic 3D view of your project that allows you to design and insert new components, see conflicts and create construction plans in sufficient detail to allow for pre-fabrication of many components and limit costly field modifications. Also by capturing data with the 3D laser scanner you can greatly minimize the return trips that are often required to locate objects that have been missed when utilizing traditional survey methods. Project deliverables are customized to the needs of the client. 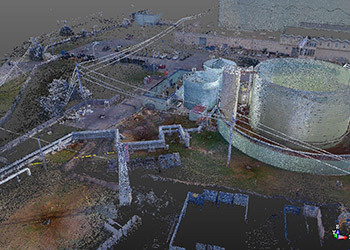 Hanover can provide a point cloud of the 3D scanned project that allows the client to view and measure objects. A 3D model can also be provided that allows the client to simply design and insert components. Customized deliverables allow the client to contract only the services needed for their project. 3D laser scanning can also enhance safety since it can obtain measurements from a safe distance or location without having to put someone in a dangerous environment. The technology can measure objects from only a few feet to hundreds of feet away without a human having to physically make contact with project objects. Laser scanners can also be utilized to limit entry into confined spaces. Whether you are simply documenting existing conditions, retrofitting a pipe fitting, remodeling a building or designing a new bridge, 3D laser scanning will save time and money.